Steel and fire. Hammer and anvil. Fold and file. Tang and spine. Edge and tip. Quench and temper. Shave and shape. Grind and hone. Heel and handle. Sheath and strop. Sippican Cottage says, "Make Something If You Can. Own Something Someone Made In Turn I've lived a fair bit now. Long enough to see simple commodities that everyone thought were consigned to the ministrations of machines alone on a factory floor being made by hand again." As one who has hand forged a few knives out of old worn out files, I have SO envied those of my fellows who have the resources to make damascus steel blades. Damascus blades, when properly made are among the finest objects still hand crafted, but the investment in tools and shop space was always beyond my modest means. Some years ago I saw a display of Japanese katanas. 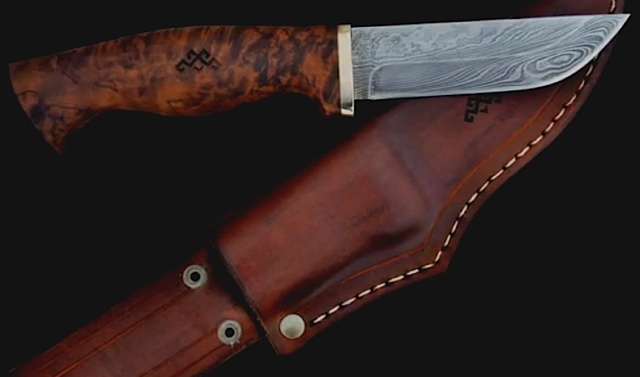 Trust me when I say that twenty thousand layer damascus blades are not only possible but awe inspiring. Thank you for sharing that video. Inspirational to me - time to do something. Have you seen what these guys do? Angel Swords. Tell me, is it wrong to lust over something so beautifully made? I wonder how much I can get for selling my children into slavery? If I were a young man again, I'd apprentice myself to a toolmaker. Art...beautiful art...will always have a place in our world. This is an inspiring example. Thank you. It's a similar, exacting process to how samurai swords are made. Both Damascus steel blades and samurai swords are true works of art that will stand up to an amazing amount of abuse in the real world. @Pdwalker, I visited an Angel Swords display at a Renaissance fair once. Their wares were beautiful and functional, but they didn't have quite what I was looking for at the time, and I walked away empty-handed. I have since regretted that, now that their prices are far higher than the ones quoted to me at the time.